Whether you are starting out or engaging with a large set of facebook followers it’s important to stick to some simple principles to maximise engagement and increase your audience. 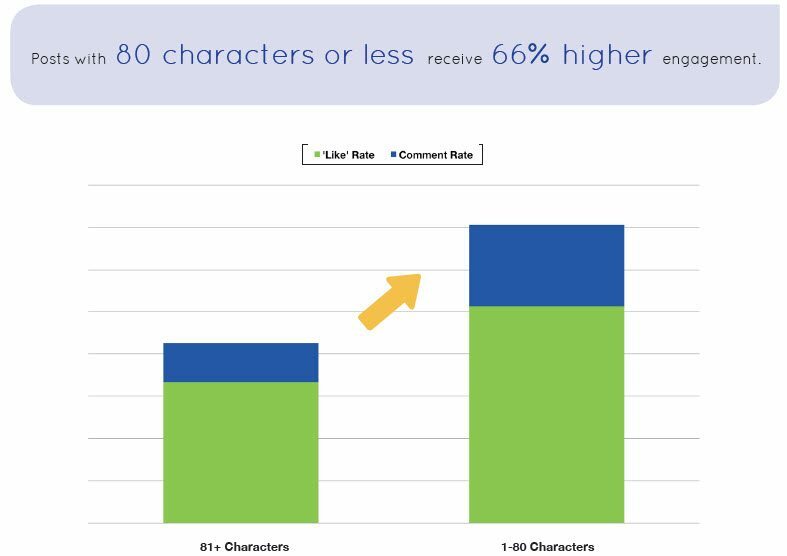 Facebook posts perform consistently better if you are short and to-the-point. This means steering away from long posts and keeping it simple. But how long should they be? Recent studies and our own data back up that posts less than 80 characters can increase engagement by 66%. Additionally there is an 86% increase if the status is kept to under 40 characters. So, do your utmost to keep it short. Without a highly engaging image your post will not be as effective as it could be so spend a reasonable amount of time to review the best images and maybe even get others to review your image choices before you commit. Tip #3 – When to post? Timing is not everything, but with Facebook it’s important. Your post should align when the most number of followers is online and engaged with Facebook. This maximises your organic reach during times that are aligned with the most number of followers are ready to view your content. Overall, you should always be looking at the numbers. While the above Tips are useful for a general audience your specific audience may well be different. So it’s important to tailor your posts according and to not be afraid to try a few different and new methodologies to see what works and what doesn’t. Make sure to read my article on Facebook Marketing Mistakes to make sure you don’t make any rookie errors. If you have seen results different to mine I would be very keen to hear about it. Please leave your commentary below.